The setting of 2012’s Pusher story has been transposed from Copenhagen to London. Frank (Richard Coyle) and his annoying buddy Tony (Bronson Webb) are going to meet a regular customer named Fitz (Paul Kaye) to sell some “product”. Frank loses his cool for a moment as Fitz doesn’t have the right amount of cash for the transaction, and so Frank takes the extra value of the product out of the plastic bag, wraps it inside a ripped magazine page and takes Fitz’s money for the rest. It’s clear in that first transaction that Frank is doing this just to get by and will not budge on the price because he simply can not afford to. The two friends go on to have some fun out on the town that night. At one of the clubs they visit, Tony seems to be setting up a potential deal as Frank watches from across the dance floor. The next day, Tony alerts Frank to this mystery person’s interest in buying some “gear”. Frank organises a meeting with the man, finding out it’s his former prison-mate who just got out. The man is interested in a large amount of cocaine, half a “key”, or kilo (how many slang terms are there for drugs?! ), which Frank doesn’t have. So, he visits his biggest supplier, Serbian drug lord Milo (Zlatko Burić – the same actor who played the character in the 1996 original) to attain it. He already owes Milo money, but Milo gives him the coke in good faith that he will come straight back with the money to pay his debt, since it is such a huge deal. This is where things start to turn sour for Frank, as the deal was a bust, and he ended up being swarmed by police who chased him into a nearby lake. He then proceeds to dump the product in said lake. Upon a bout of questioning that implied a friend snitched on Frank, he is let out of custody with no real proof against him and starts to spiral out of control; paranoid, angry and desperate to find the means to pay Milo back. As the film progresses, Frank descends into an increasingly deeper hole of desperation and fear. Frank’s path to getting the cash he needs leads him to blackmail and intimidation of others, and also some very extreme behaviour as the clock ticks ever closer to the given deadline. Richard Coyle does a fantastic job playing a man with his life threatened and hanging in the balanced. Zlatko Burić is almost like The Godfather; strangely charismatic but evil at his core. His demeanor along with those of his henchmen, gradually change, but he somehow maintains this unpredictability in the performance throughout. The only true disappointment for me as it relates to the plot/story is how the film begins and therefore how it ends, because the beginning is in fact a glimpse of the conclusion (almost like a flash-forward). The issue with the ending in particular is that it’s very sudden, vague and ambiguous. This isn’t a spoiler for the above reason, but Frank is basically chasing after a cab with his girlfriend in it. But the cab seems to come to a stand-still as he stares at her through the back passenger window. It may be symbolic (watch and you’ll understand), but it’s presented quite literally, which is what breeds the confusion. There’s something about English film-making that gives off a natural grittiness. It could be argued that it’s because of the constantly dreary weather in England that creates that darker mood, or that the low-budget only allows for cheaper equipment and so it’s not as glossy and “perfect”. But I actually believe it’s the influence of the actual drug sub-culture of urban England. Granted, drug and alcohol usage and abuse has been decreasing over the years, but it’s always affected its youth population. Most English films I’ve seen deal with hard drug use. 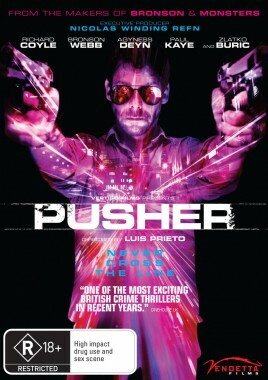 Pusher is no different, however with a higher budget and more resources at their disposal, the filmmakers have managed to create a somewhat more colourful visual tonality than the original. The original was very rough, filmed entirely on handheld cameras that you and I could go out and purchase. In essence, it was a much rawer film, partly due to those limitations, but also because that is what Refn intended. Refn wanted an almost documental style, and this remake most definitely veers away from that type of directing. Director Luis Prieto employs some slick editing and more than a few jump cuts to express the panic and volatility of Frank’s mind and situation. It’s an overall cleaner experience, but still effective in portraying the instability of this life, doing well to not glamourise the lifestyle in the process. The soundtrack was provided solely by British band Orbital, and it’s perfect. The duo specialise in electronica/dance, which may not sound like a fitting choice at first. But the soundtrack is pulsing and adrenaline filled, representing the drug/club culture shown in the film well. When it’s not being used in the club scenes, it helps create a thriller-like atmosphere, evoking a sense of anxiety – especially as Frank becomes increasingly desperate and scared. We were given a screener to review, so we are unable to comment on the DVD extras and presentation that will be present on the final home media releases. We can only comment on the film itself, and I am happy to say that this remake treats the original screenplay with reverence and total respect. Richard Coyle gives a magnetic and powerful performance that truly carries the film, along with a great supporting cast. The ending leaves a lot to be desired and is even more vague and abrupt than the original’s. There were also some horizontal lines/visual artifacting present, which were disappointingly abrasive, but I see it being a problem exclusive to these screeners. Nonetheless, Pusher is a compact, well acted, well shot remake that does itself justice and pays due respect to the original by not jarringly changing its plot.